ThriftyHawk noun - A VTR1000 which is being maintained, personalized and customized on a budget without compromising safety, reliability, performance and also without anything that would (hopefully) be considered trashy. Otherwise I would of called it CheapHawk. - Rode perfectly with no pulling, drifting or any other odd quirks. 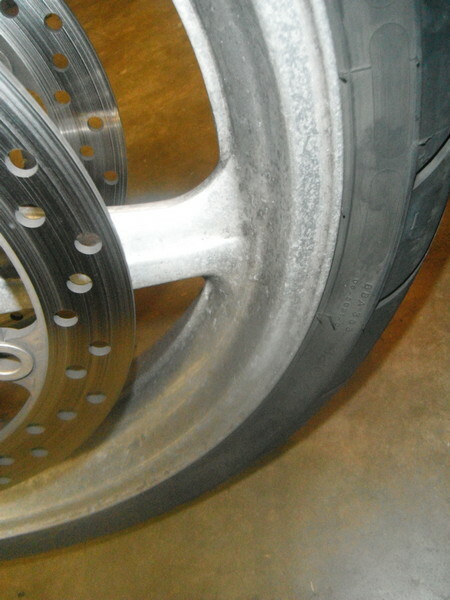 - New rear tire (under 500 miles). - Rear brake pads almost new. 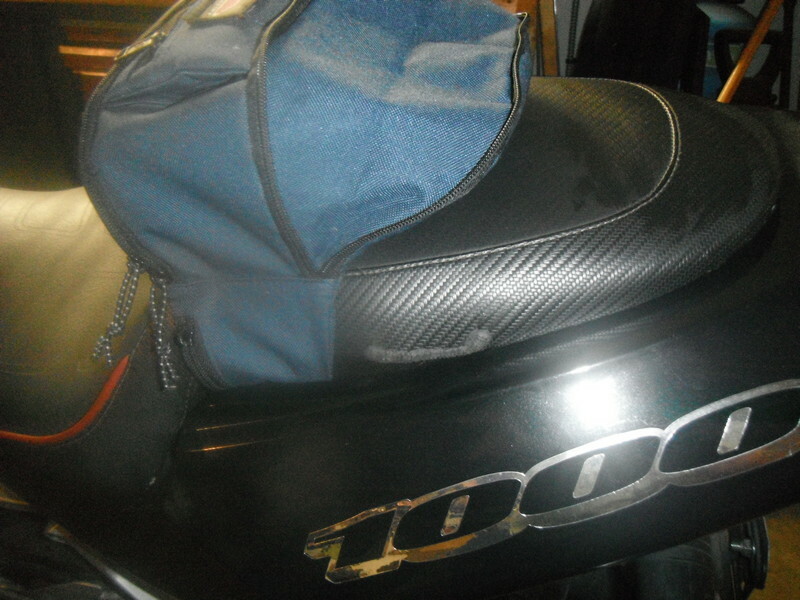 - Rear seat cover mounting tab broken. 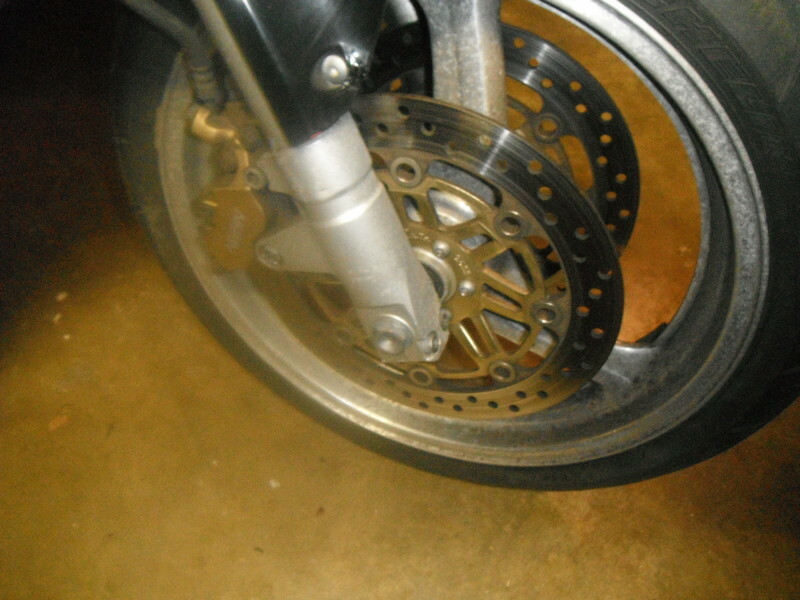 - Severely worn sprockets and chain. - Chain had excessive play. - Front tire down to wear bars. 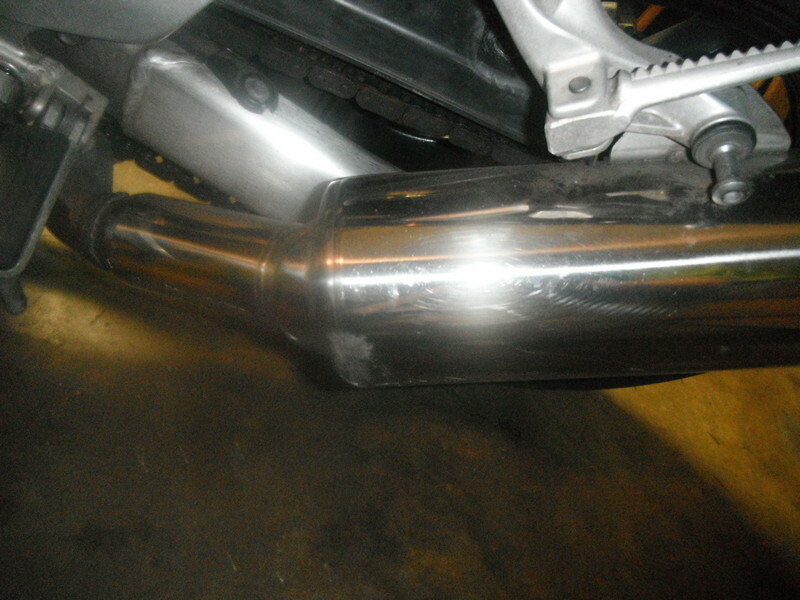 - Scrapes on sides of both mufflers near inlet. - Forks were misaligned in triple trees. 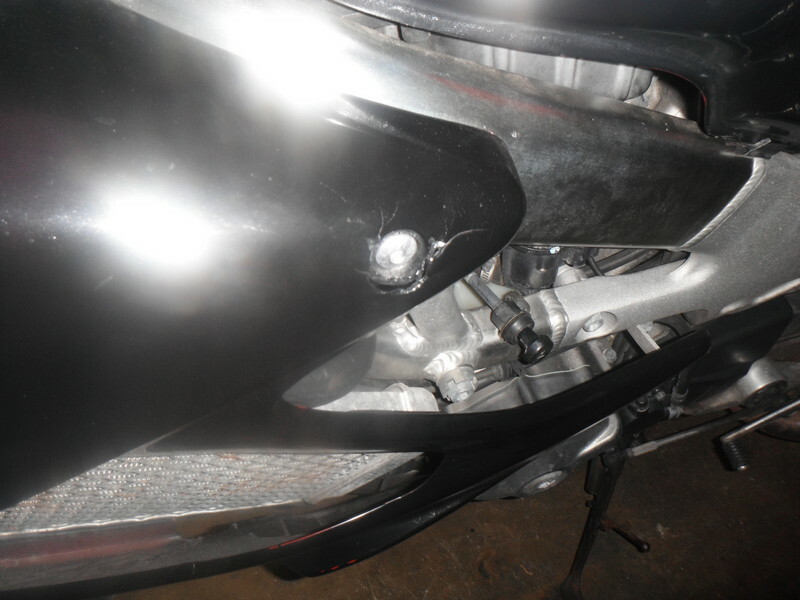 - Front fender cracked and then repaired. - Crack around front left fairing mounting bolt. - Lower right muffler mounting bolt missing. - Lower right muffler clamp loose with bolt frozen. 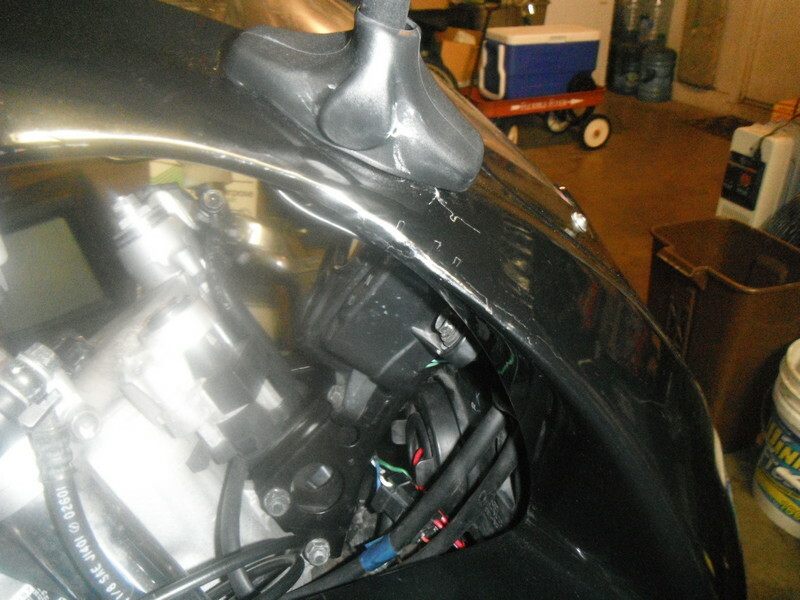 - Small blemish on top right fairing by mirror mount. - Right chain adjuster bold frozen and head rounded. - Front wheel stripped of paint, pitted and tarnished. Also the seller included new EBC brake pads for both front calipers, 4 quarts of Mobil-1 motorcycle synthetic 10w40 and a Hiflofiltro oil filter. - Replaced lower right muffler mounting bolt. 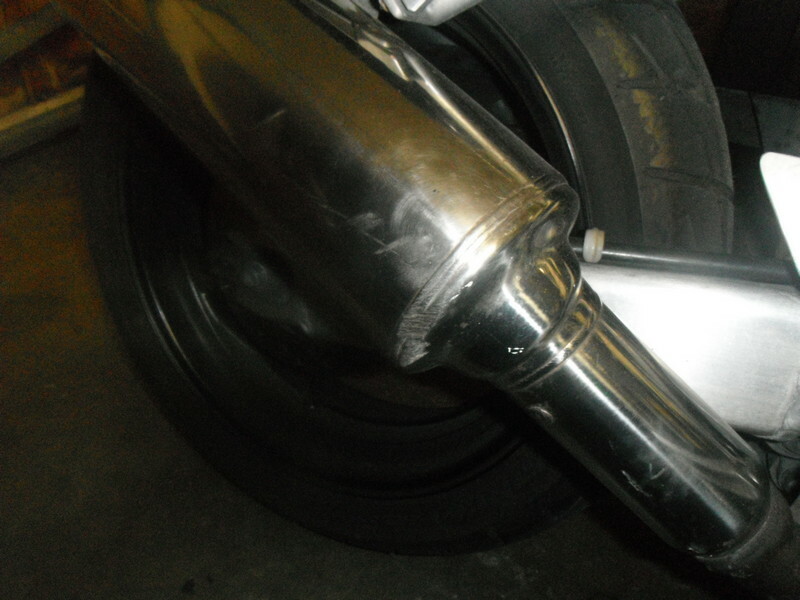 - Unfroze and tightened right muffler clamp. - Changed the oil and filter. - Mounted DIY tail pack. - Sand, fill, prime, paint, and clear coat front wheel. - Clean and clear coat rear wheel. 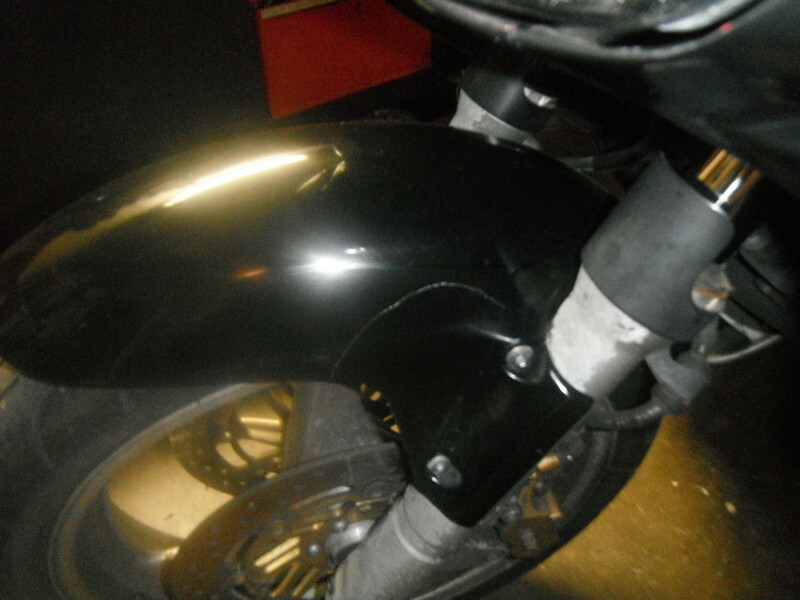 - Repair crack and blemish in fairings (or replace). Oh and this isn't the original color, it was red originally but was repainted black which I suspected since the decals were not clear coated over and just stuck on. Well I was noticing some tapping noise from the top end and discovered it was the cam chain tensioners so I decided to try and convert the OEM tensioners to manual. Well I botched that conversion so ThriftyHawk is down until I get some manual tensioners but better safe than sorry. lots of thrifty options for that part! I did the mod straight away when I got my VTR because I knew about the issue before I bought the bike. I tried to get familiar with all the weaknesses so I could make a good decision on buying another bike. There are quite a few options for modification, the bike is easy enough to work on, (my BMW is much better on that count). Not as many mod parts out there as I would have thought but it's a game of treasure hunting. I just ended up buying some manual tensioners off ebay and should have them between sometime between Feb 6 and Feb 9. Well I installed the tensioners on the 6th and had the front tensioner assembly mounting bolts work their way loose on the 8th. 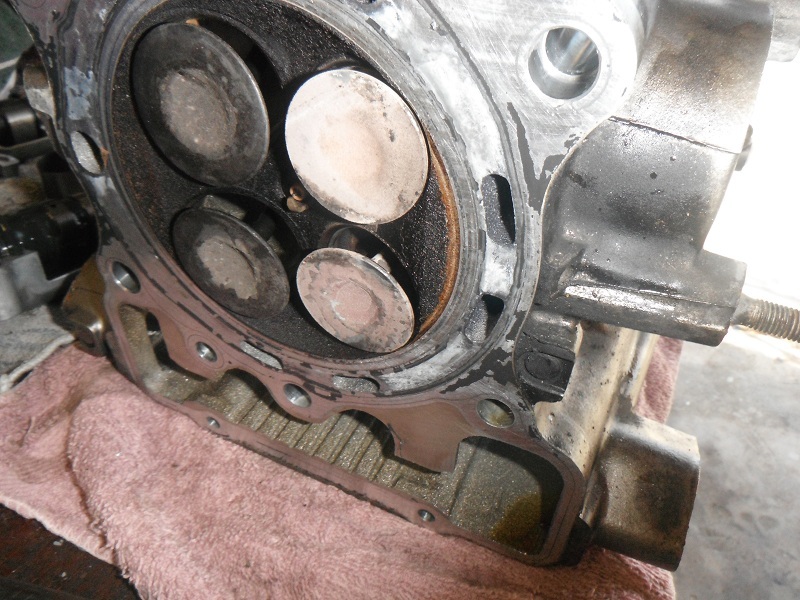 So now I have a front cylinder head with bent valves due to improper torquing of bolts and/or no loctite. Just bought a used cylinder head and will be ordering new head bolts, head gasket, valve shim kit and a new cap that goes over the stator plug cover since the previous owner mangled the internal hex on this one. Well it's confirmed that the valves are bent. 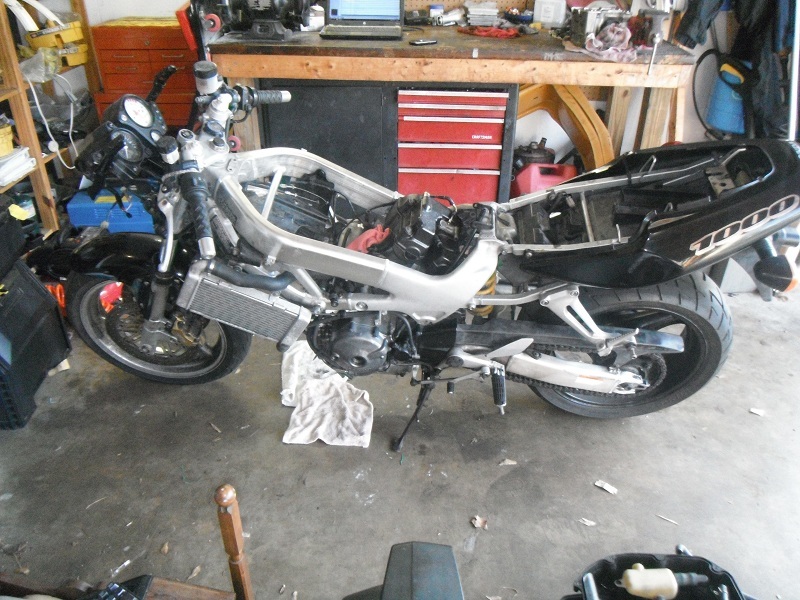 So now the bike sits until I get the rest of my parts, valve shim kit, head gasket, among various maintenance items. I should have everything somewhere between Feb 22 and 28 and hope to be riding within the first week of March. Here how it sits for now. Ouch, that really did let go. Loctite or gasket seal around the thread is important. This serves two purposes, first, it acts as a brake to slow the thread from unscrewing if it becomes loose. Though it shouldn't! And second, it stops any slight oil leaks that may creep along the thread. Just unscrew the tensioner all the way before applying it, so when you tighten it up it gets right in between the surfaces where the thread makes contact. Currently waiting on my head gasket, spark plugs, spark plug wrench, Honda OEM air filter and speed bleeders. Everything except the speed bleeders will be delivered on Monday the 25th and the speed bleeders on the 26th at the earliest. Hopefully I'll have the bike running again by the end of the month. Last edited by mike21091; 02-24-2013 at 04:41 AM. It's finally running like new! Although it has been running since the beginning of the month it wasn't running like it should. Long story short it was a combination of cam timing being off on both by two teeth on the front, a vacuum leak due to a brittle hose going to the petcock and me not realizing the leak and trying to tune the carburetor. Now that it's all taken care of it's running like it should and is pulling great, just need to tweak the pilot screw 1/16 or a turn at the most since there is just a small carb fart when cruising at 3500rpm. I also want to say thanks to everyone on this forum for their help. Now I'm pissed off that I managed to crack the fairing in two spots and scratch my tank while working on it over this month. I'll be posting some pic's of how it sits now within the next few days.